Dividend stocks have been in vogue for several years, strongly buoyed by investors seeking meaningful yield in a generally yield-starved investment environment. Canadian small-cap dividend-paying stocks have seen especially robust demand. They outperformed their peers paying no dividends over both three- and five-year investment horizons, rallying 44% and 35%, respectively, while non-payers declined 2% and 23%, respectively. Investors pursuing the small-cap income investment strategy can benefit greatly from both rapid growth of the small-cap companies and their high dividend yields for regular income. Indeed, while price volatility and risk of the small-cap stocks are generally higher than those of the large-cap stocks, small cap dividend-paying stocks provide a major opportunity for both strong income growth and capital appreciation. There are several small-cap dividend payers among stocks listed on the Toronto Stock Exchange (TSX). A small group of these stocks pay attractive dividend yields that are sufficiently covered by earnings to assure dividend sustainability. A closer look at this selected group of dividend payers reveals investment opportunities for risk-prone investors, who embrace higher risk to achieve higher-than-average rates of return. Still, investors are cautioned to be prudent with their investments in small-cap dividend payers, given that valuations of these investments have been stretched due to a robust demand. Parkland Fuel (TSX: PKI), a C$1.2-billion company by market cap, markets and distributes petroleum and other products, including propane, fertilizer, lubricants, home heating oil, other agricultural inputs and industrial products and services, as well as gasoline and diesel. The company’s dividend is yielding 5.6% on a payout ratio of 82%. Parkland Fuel’s monthly dividends were reduced in January 2011, and have stayed flat since. The stock is trading on a P/E of 14.7, at a premium to its industry (with a P/E of 10.1), but at a discount to its own three-year average of 17.3. With an average daily turnover of 178,000 shares, this stock is selling for C$18.46, up 49% over the past 12 months. The stock has a beta of 0.90, below the market’s measure of volatility. Bird Construction (TSX: BDT) is a general contractor serving clients in the industrial, mining, institutional, retail, commercial, multi-tenant residential, light industrial, and renovation and restoration sectors. The company engages in general contracting, design/building, construction management, pre-construction services and public/private partnerships. Its market capitalization is C$580 million and average daily trading volume is 37,000 shares. The stock pays a dividend yield of 5.2% on a payout ratio of 65%. Over the past five years, its dividend, paid out monthly, grew at a rate of 10.8% per year. The stock has a P/E of 11.0x, compared to an industry ratio of 26.3x. The stock is trading at C$13.63, up 21% over the past 12 months. Its beta is 1.61, implying significantly higher volatility than the market’s. Cascades (TSX: CAS) is nearly a C$400-million company by market cap. It produces, converts, and markets packaging and tissue products. The stock is paying a dividend yield of 3.8% on a payout ratio of 63%. The company’s quarterly dividend of C$0.04 per share has been fixed since 2003. In terms of valuation, this stock is trading on a P/E of 16.5. For the reference, its rival Orchids Paper Products (NYSE: TIS) has a P/E of 16.4. Cascades’ stock, which has an average daily turnover of 105,000 shares, is currently changing hands at C$4.13, up 4.3% over the past 12 months. The stock has a beta of 1.67. Calfrac Well Services (TSX: CFW), with a market cap of C$1.1 billion, is a specialized oilfield services company providing fracturing and coiled tubing services to oil and natural gas E&P companies. Each day, on average, some 249,000 of its shares trade in the open market. The stock pays a dividend yield of 4.1% on a low payout ratio of 27%. Over the past five years, Calfrac Well Services’ dividends grew spectacularly, on average, by 58.5% per year. Dividend growth will likely be sustained in the future, albeit at a slower pace. With a P/E of 6.7, the stock is trading at a discount to its industry, whose P/E averages 15.8. Calfrac Well Services’ stock is changing hands at C$24.65, down 6.1% over the past year but up 30% over the past five years. Its beta is high at 1.95. Canyon Services Group (TSX: FRC) is an oilfield services company, providing specialized stimulation services to exploration and production (E&P) companies. The company has a market capitalization of C$690 million and an average daily trading volume of 195,000 shares. The stock has a dividend yield of 4.6% and a payout ratio of 43%. Its annual dividend payout in 2012 is more than five times larger than last year’s. 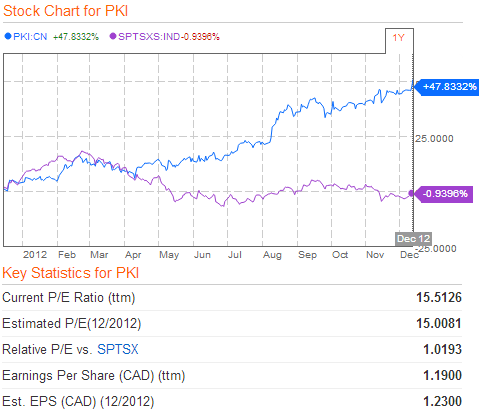 The stock has a P/E of 7.9x, half that of its respective industry. Its price-to-cash flow ratio is also attractive at 6.3 versus 13.3 for its industry on average. The stock is changing hands at C$11.22, down almost 3% over the past year, but up 434% over the past five years. The stock has a high beta of 2.5. Horizon North Logistics (TSX: HNL), a C$745-million company by market capitalization, provides camp management and catering, mobile structures, matting solutions, and northern marine services to resource companies. This stock pays a dividend yield of 2.9% on a payout ratio of 33%. Its quarterly dividend expanded, on average, by 25% over the past year. In terms of valuation, Horizon North Logistics has a P/E of 11.5, trading at a discount to its respective industry with a P/E of 15.8. With an average daily trading volume of 260,000 shares, this stock is changing hands at C$6.89, up 57% over the past 12 months. The stock has a beta of 2.09, more than double the market’s volatility. Killam Properties (TSX: KMP), with a market capitalization of C$654 million, is a real estate company, involved in the acquisition, ownership, development, operation, and management of multi-family housing and manufactured home communities in Canada. On average, each day some 128,000 shares of Killam Properties’ stock change hands in the market. The stock pays a dividend yield of 4.7% on a payout ratio of 57%. Its dividend grew at an average annual rate of 6.7% over the past five years. The stock has a P/E of 13.0, below the average ratio for its respective industry of 21.6x. The stock is trading at C$10.99, up 8.72% over the past 12 months and 42% over the past five years. Killam Properties trades with a low beta of 0.67, implying lower volatility than the overall market’s. McCoy (TSX: MCB), with a market cap of C$116 million, is a provider of specialized equipment, service and replacement components to the global oil and gas sector. It produces drilling and completions equipment as well as heavy duty trailers used in the oil and gas sector for pressure pumping, coil tubing, and rig transport. The stock pays a dividend yield of 4.1% on a payout ratio of 45%. Its dividend grew, on average, by 12.2% per year over the past five years. In terms of valuation, with a P/E of 9.7, the stock is priced below its three-year average of 12.9 and the industry’s P/E of 15.8. On average, some 30,000 shares of McCoy change hands in the market each day. The stock is trading at C$4.21, up 46% over the past 12 months. The stock’s beta is high at 1.55. Russel Metals (TSX: RUS), a C$1.65-billion company by market cap, is engaged in the processing and distribution of metals. This company pays a dividend yielding 4.9% on a payout ratio of 80%. Its quarterly dividend was slashed in late 2008 and again in the first quarter of 2009; however, since the dividend has increased 40%. The metals processor has a P/E of 17.2, above its three-year average ratio of 16.3x, but below the ratio of its industry on average of nearly 31.0. The stock, which has an average daily turnover of 274,000 shares, is changing hands at C$27.42, up 18.3% over the past year. The stock has a beta of 1.38. Exco Technologies (TSX: XTC), with a market cap of C$231 million, manufactures dies, moulds, equipment, components and assemblies to the die-cast, extrusion and automotive industries. The stock is yielding 2.5% on a payout ratio of only 25%. Its dividend grew, on average, by 18.9% per year over the past five years. This dividend growth stock boasts a P/E of 9.5, trading at a discount to its respective industry, with a P/E of 11.4. The stock, which has an average daily turnover of 40,500 shares, is changing hands at C$5.70, up nearly 73% over the past year. For the change, the stock carries a low beta of 0.25, carrying only a quarter of volatility experienced by the market on average.